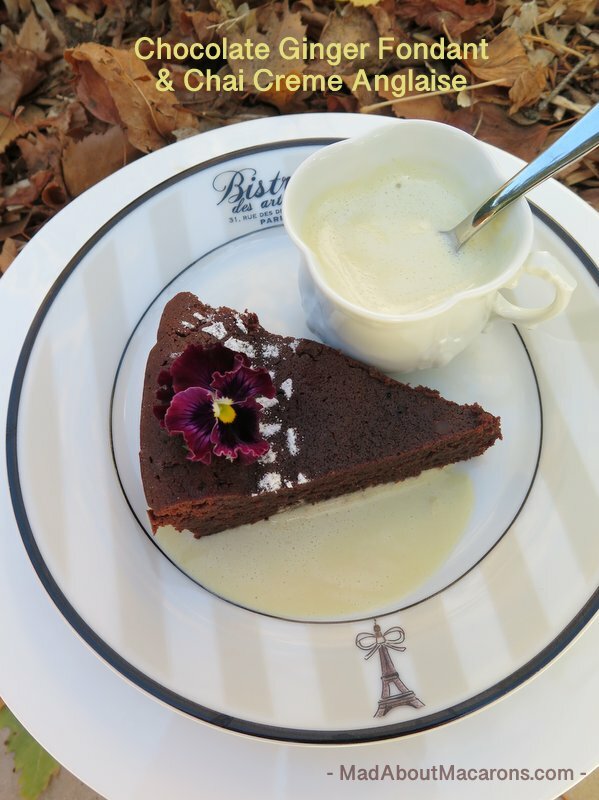 Trust the French to transform just a few simple yet good quality ingredients into a most elegant dessert. This dark chocolate mousse is also an extremely light chocolate mousse. Unlike many recipes I’ve tried, this one essentially consists of dark chocolate with whipped egg whites. 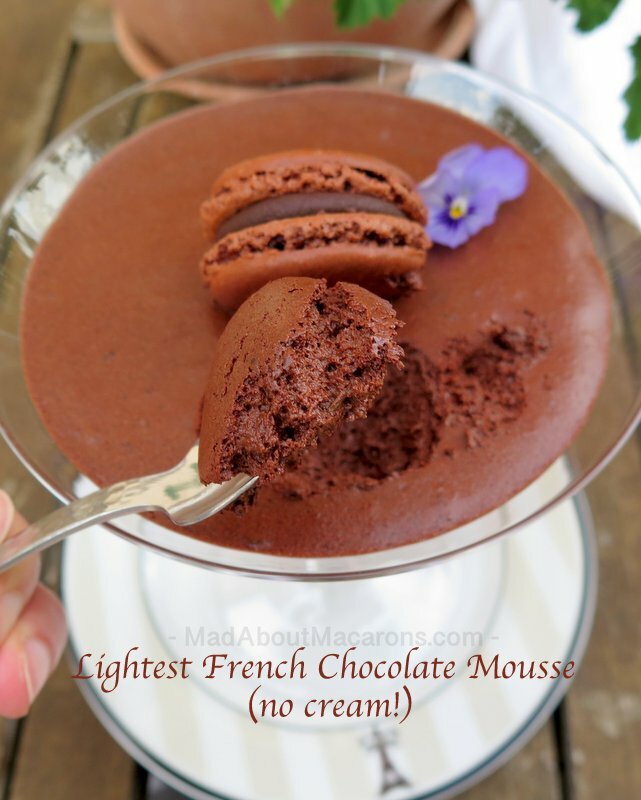 So, it’s a light yet dark French chocolate mousse – without any cream! 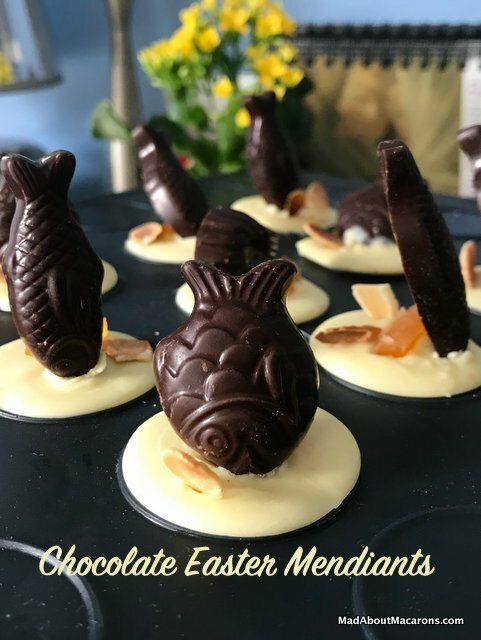 It’s not unlike this egg white-based light-as-a-feather white chocolate mousse with orange blossom but this dark chocolate one is decadent for serious chocolate lovers. 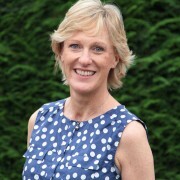 Just before Julie left recently for her new studies in London, I’d asked what she’d love as her favourite meal together as a special send-off. It was classic lasagna (it was also a toss-up for this Corsican Cheese and Spinach Lasagne), loads of unpasteurised cheese, followed by this dark chocolate mousse for dessert. Her list didn’t stop there, though; she added, “and a batch of chocolate, chestnut and cinnamon macarons, please.” with her most beautiful eyes sparkling over a cheesy grin that melted my heart. How can a Mum refuse that? So, as you can see, her wish was granted – including an extra bonus of unusually warm weather so that dinner was outdoors – and before I could say, “Let’s keep some macarons for teatime tomorrow ….” the whole lot disappeared. I wasn’t complaining; I’d kept the other box aside, hidden at the back of the fridge! Although, they’ve got used to that trick by now so ended up putting the rest in the freezer. 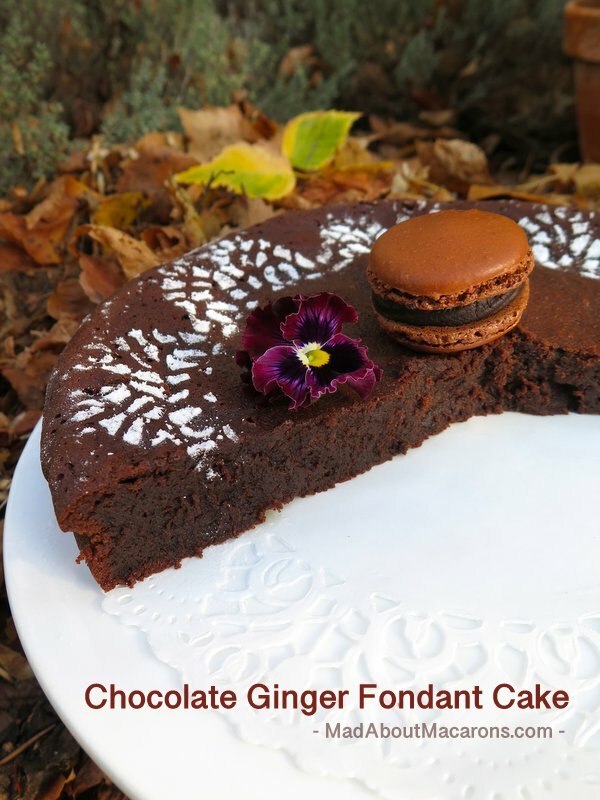 Incidentally, the recipe for the dark chocolate macarons with chestnut and cinnamon is in my book, Teatime in Paris. 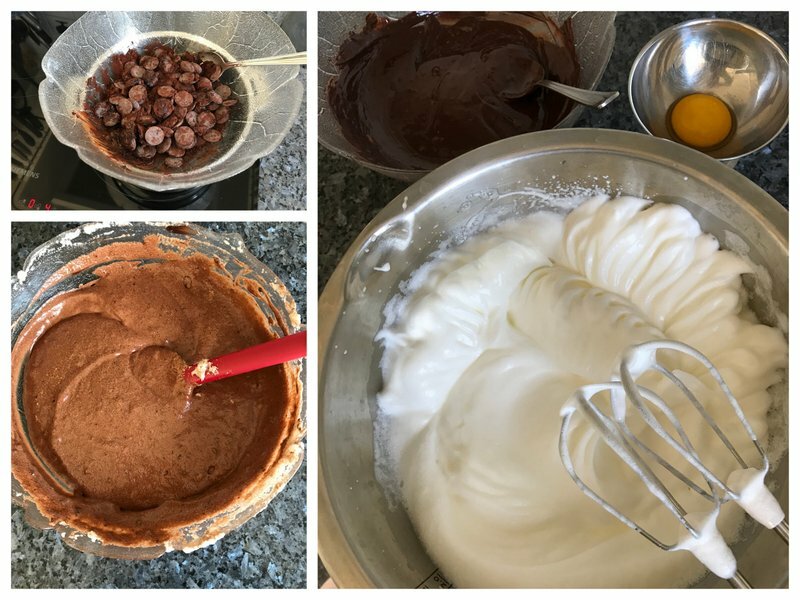 As you can see from the recipe card below, the recipe is so easy: it’s basically melting (good quality) dark chocolate and unsweetened chocolate powder together over a pan of simmering water, then adding one egg yolk and whipped up egg whites with sugar. 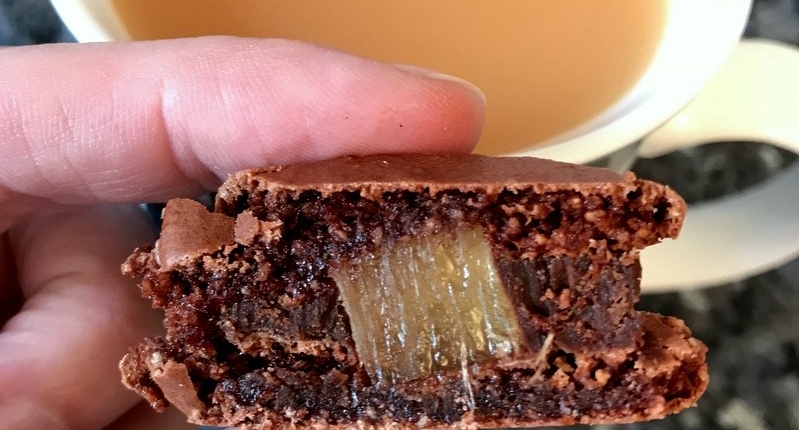 Although slightly tweeked with more dark chocolate, less powder and the addition of salt, this is my favourite recipe inspired by Raymond Blanc. Speaking of Blanc, only ONE egg yolk is used, so I’d suggest making any of the recipes from the egg yolk recipe database in advance. 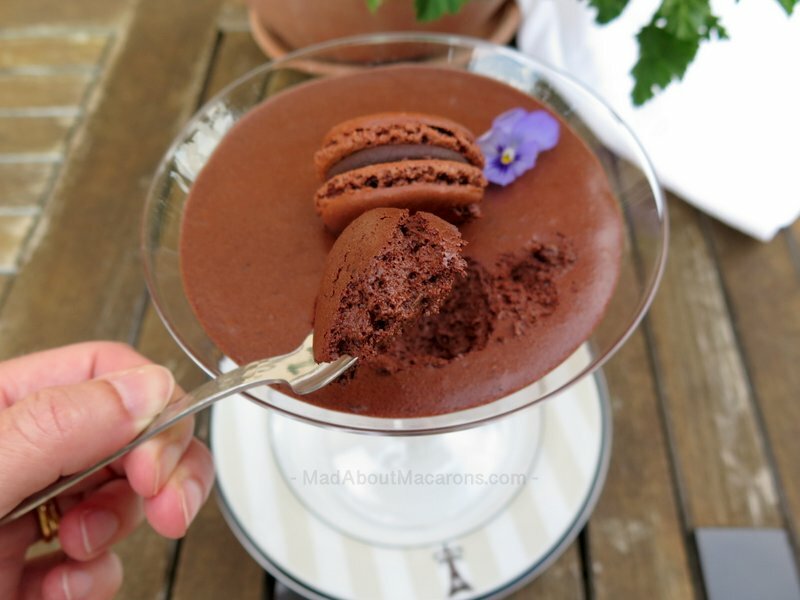 That way you can put aside plenty of egg whites (I normally store them in a clean jam jar in the fridge for up to 5 days) to make this mousse – and indeed, homemade macarons! 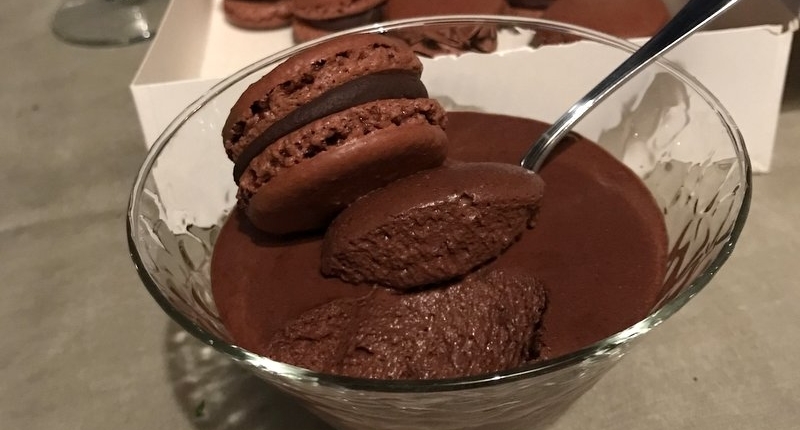 A French classic without any cream: a light and intensely bittersweet dark chocolate mousse for serious chocolate lovers - topped with the most fondant macarons. Melt the chocolate and cocoa powder together in a bowl over a pan of simmering water (Bain-marie), taking care not to overcook the chocolate (don't have the water at a rolling boil, just simmering gently). As soon as the chocolate is easy to stir, switch off the heat and stir until smooth, keeping the bowl over the pan to keep warm. In a clean bowl, whisk the egg whites (using a stand mixer or electric beaters) with the sugar until soft peaks form. Quickly stir in the egg yolk and half of the fluffy egg whites then fold in the rest of the whites using a spatula, adding the pinch of fleur de sel salt. Spoon into serving glasses and place in the fridge to chill for about 1.5 hours until ready to serve. 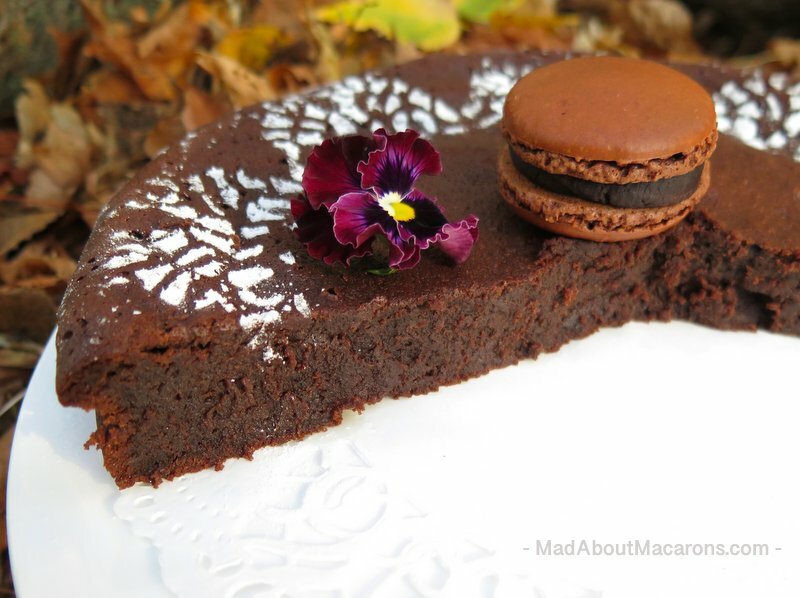 Serve with good quality chocolate macarons and garnish with edible flowers. 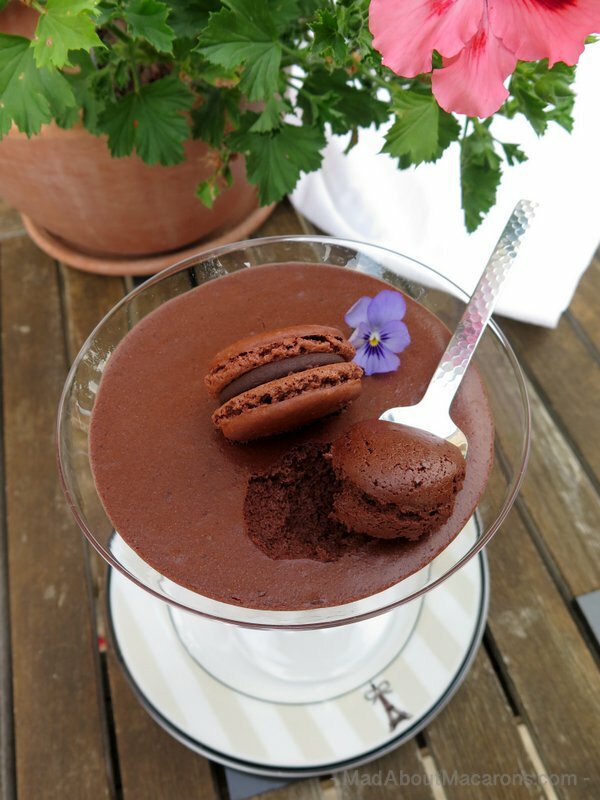 Have you made any of the recipes from le blog, my books, or fancy making this dark chocolate mousse recipe? 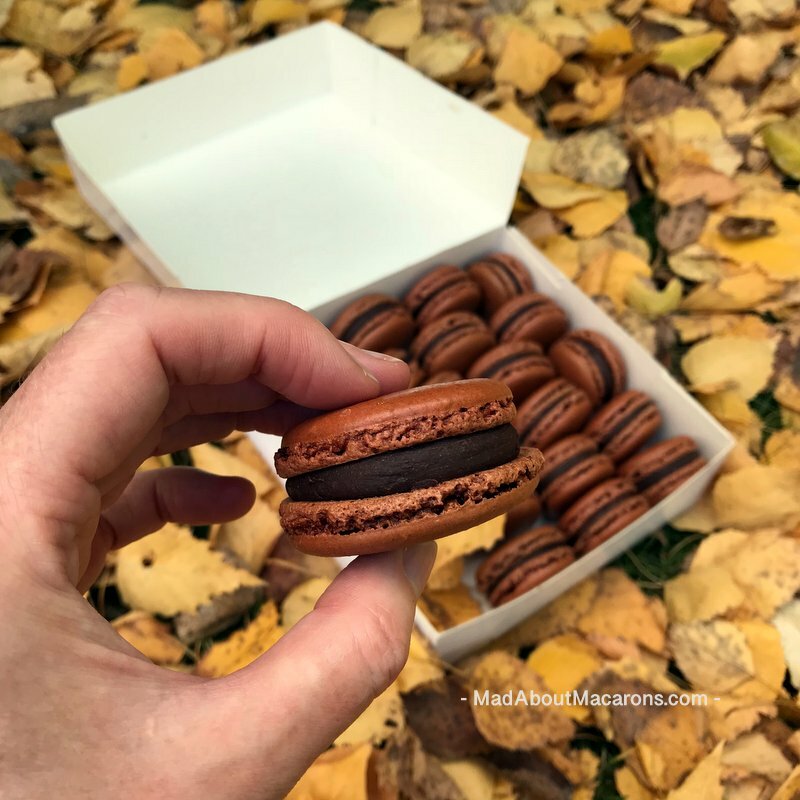 Please leave a comment below or take a picture and hashtag it #MadAboutMacarons on Instagram / Facebook, or just tell your friends to join me on le blog! 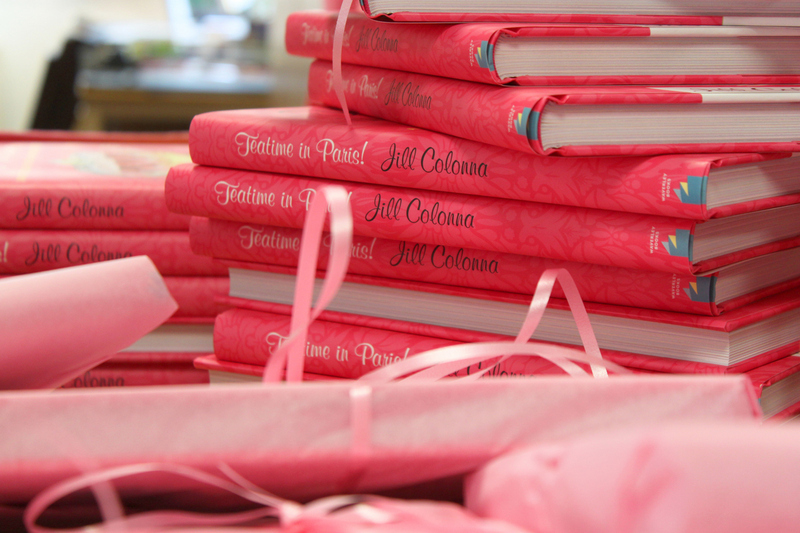 Thanks so much – I love to see you enjoying the recipes! 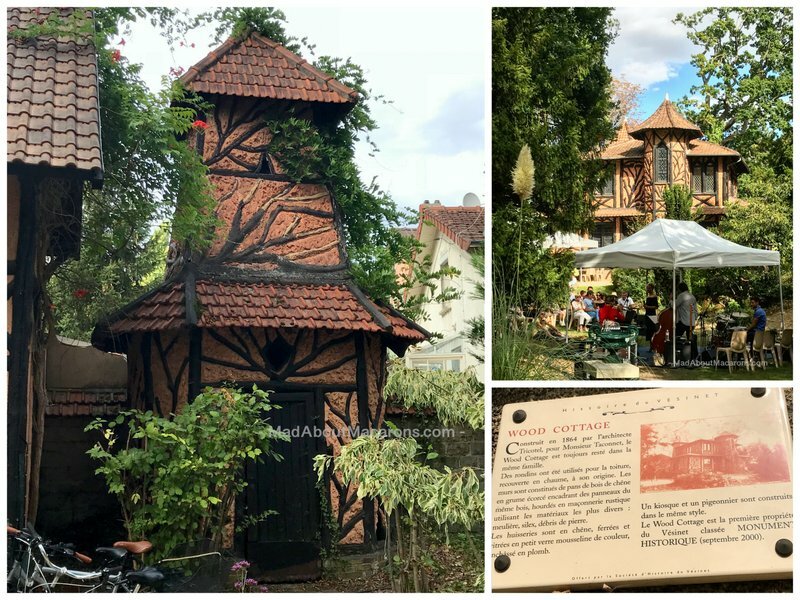 As the dark chocolate mousse was chilling nicely in the fridge, we popped along to Wood Cottage in Le Vésinet (just west of Paris, in les Yvelines), for a FREE (!) jazz concert. How lucky everyone was that day with such glorious weather. Now classed a historical monument, the 1864 Wood Cottage buildings look remarkably like chocolate, don’t they? I’ll be writing more about Le Vésinet and many other of our lovely local towns just outside Paris soon, so don’t forget to sign up below so you don’t miss any new posts. 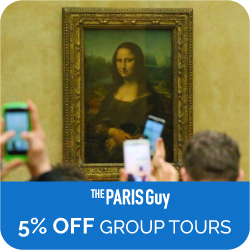 While we’re on the subject of chocolate, stay tuned for the most incredible chocolate shop personality just 5 minutes’ walk from Le Moulin Rouge in Montmartre, à l’Etoile d’Or with Denise Acabo. When I posted this Blueberry Lemon Clafoutis on Instagram and Facebook this morning, I realised to my horror that the recipe I was referring to had technical problems when printing so, before I go dashing off on my travels again tomorrow, here’s the recipe which is easily printable for you and not, “replace that with this” and so on. As you can see from the original classic French Cherry Clafoutis recipe I first posted, I have been mad about clafoutis this summer. Who can blame me? It’s such a versatile recipe that lends itself so deliciously well to all sorts of mouthwatering fruity versions – particularly plums and berries. In the latest recipes, I’ve added ground almonds (almond flour) instead of flour or cornflour, as I love the hint of almond with berries and cherries – plus the more eggy it is, the lighter it is too. Have you tried the following yet? I also made a mirabelle plum version of this recipe this weekend – and added some freshly grated ginger to it for dessert, inspired by chef William Ledeuil from Paris’s Ze Kitchen Galérie. As we’re just back from our marathon family holiday in Japan, I’m looking for ways to be a bit more playful with Asian flavours. 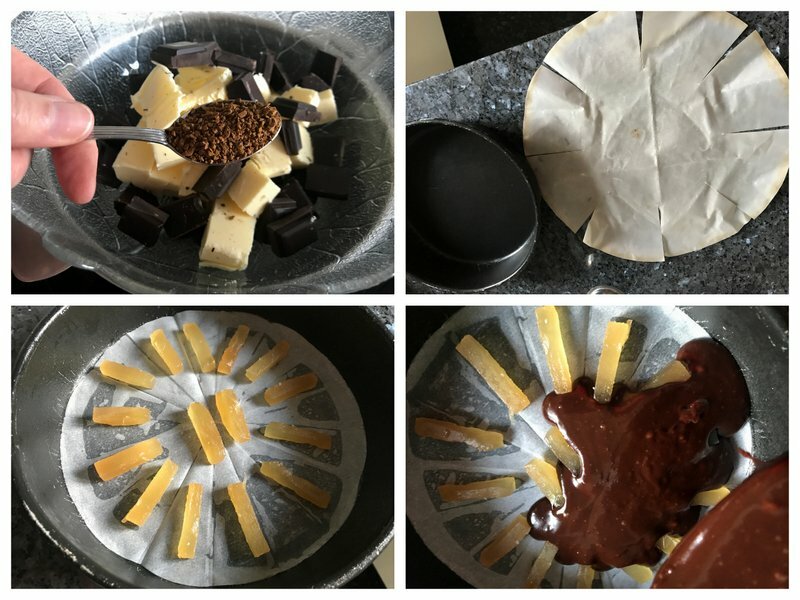 I’m currently developing and dreaming up some interesting ice creams and main dishes for you…so don’t forget to sign up below to keep informed when they come out! A quick and easy light gluten-free Clafoutis baked custard dessert, with a blueberry and lemon twist to the French classic that's great for dessert, teatime or breakfast. Preheat the oven to 180°C fan / 200°C / 400°F (gas 6). Wash and dry the blueberries. Generously butter a gratin, pie dish or deep cake tin. Top with a tablespoon of sugar and shake the dish to evenly spread it over the butter. Lay the blueberries in a single layer to cover the surface of the dish. 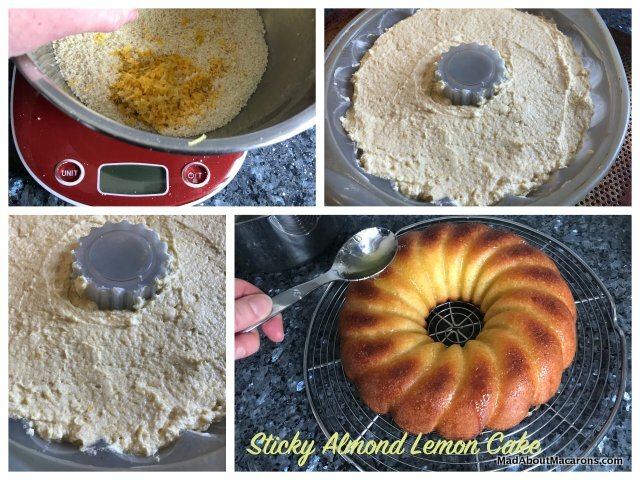 In a bowl, whisk together the eggs, sugar, lemon zest, cream, almonds and liqueur, if using. Pour the egg mixture over the blueberries and bake in the oven for about 30-35 minutes until cooked in the middle but not too dark at the edges. Set aside to cool then either serve warm or chill in the fridge until ready to serve. I also like to add some slivered almonds to the surface before baking so that they come out for a toasted extra crunch. 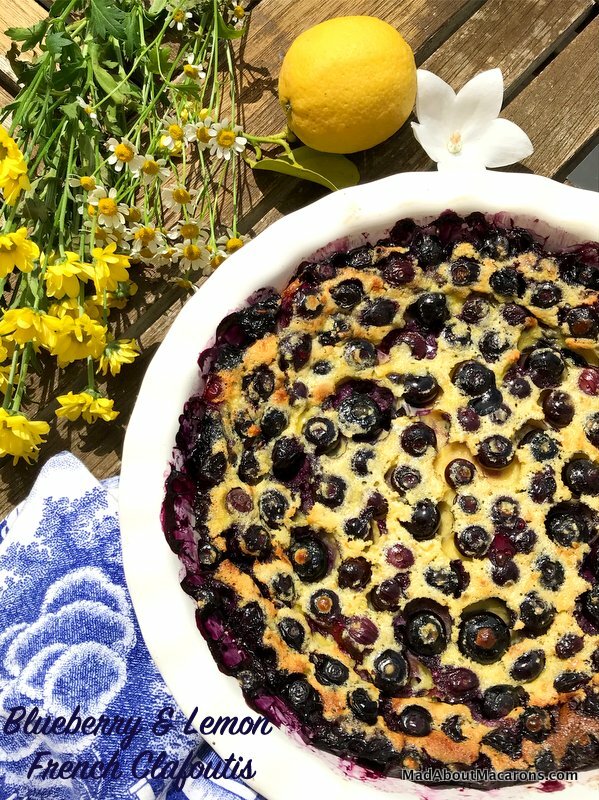 Have you made any of the recipes from le blog or fancy making this Blueberry Lemon Clafoutis recipe? Please do leave a comment below or take a picture and hashtag it #MadAboutMacarons on social media. Thanks so much for popping in! If you love blueberry and lemon, you must try this chilled French Bavarois Dessert too, with a hint of roasted coriander. 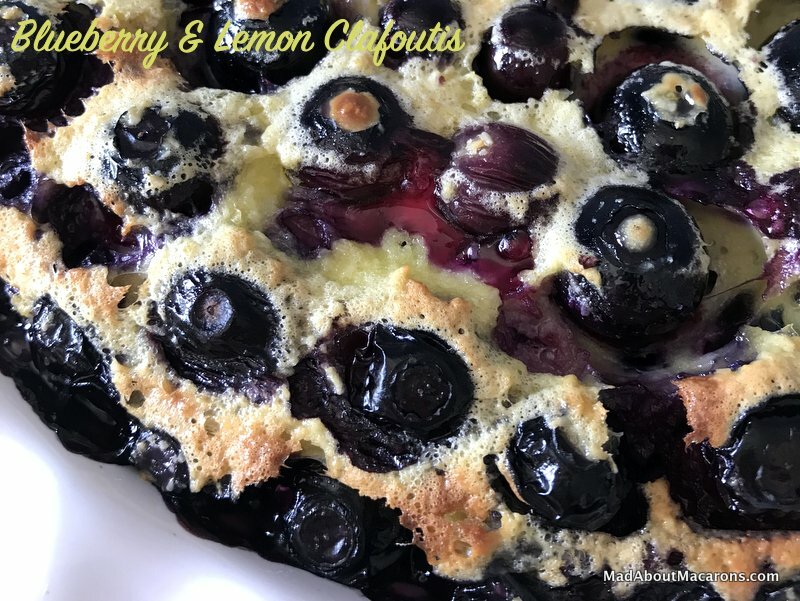 #Blueberry Lemon Clafoutis – PIN ME for later! Why am I so crazily mad about French Clafoutis at this time of year? It’s such an easy eggy custard-style classic dark cherry dessert – but it’s also just as delicious made with fresh raspberries – or my latest addictive craze, with strawberries and pistachio. Have you, however, tried it as a savoury dish? 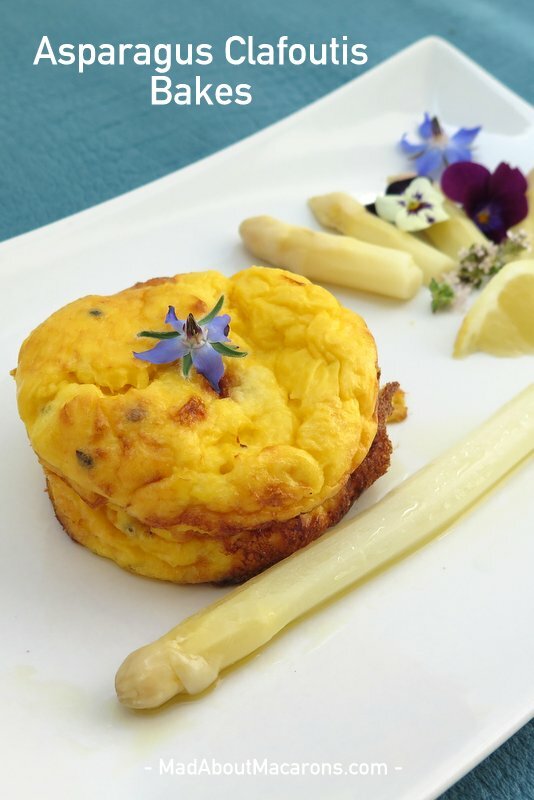 You must try this delicate Asparagus Clafoutis. You may recall I tried out this large custardy version of a White Asparagus Clafoutis recipe inspired by chef, Eric Frechon from the Bristol in Paris. However, since then I’ve lightened up the recipe. 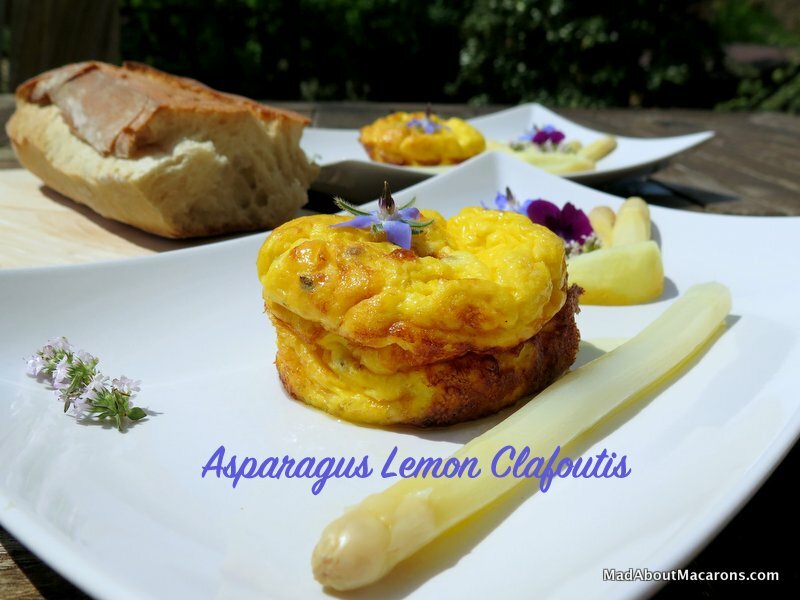 This time the asparagus shines through with less parmesan cheese and yolks, I’ve added a subtle touch of lemon zest and made them as individual Asparagus Clafoutis portions – just perfect for a summery starter or light supper served with a crusty French baguette. Just before serving, dribble a little olive oil and some lemon juice over the asparagus. 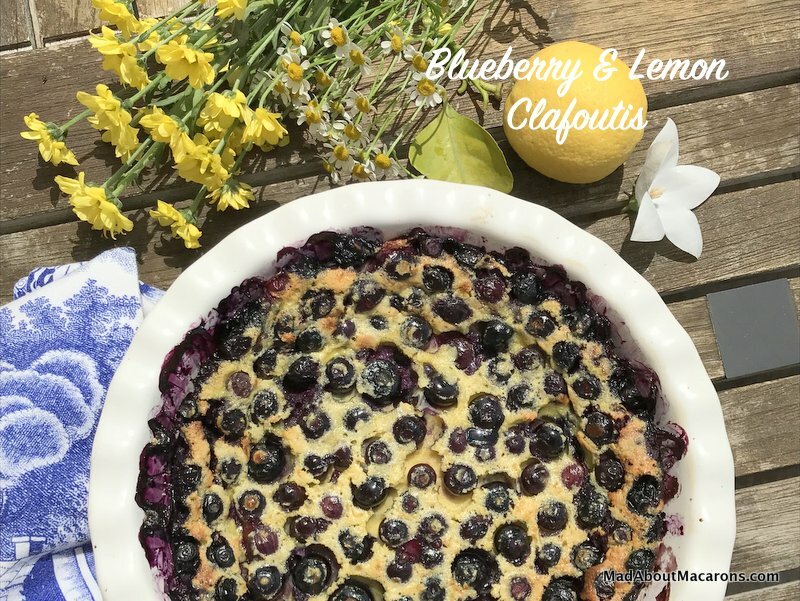 While the clafoutis are creamy enough on their own, the lemon version prefers to stay light – great for those on a summer diet! 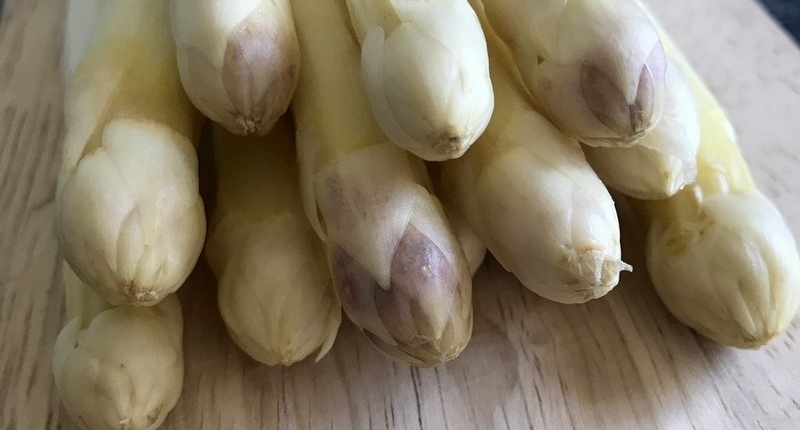 Not everyone, however, seems to be in love with white asparagus, as I’ve discovered through your comments via Facebook and Instagram. 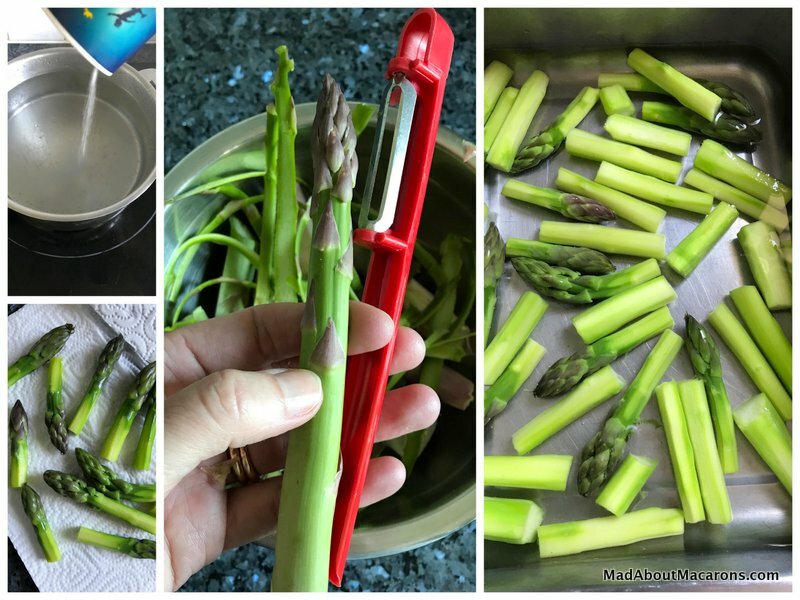 Instead, the printable recipe below is for a green asparagus version – this time without the lemon and served with the most silky, creamy parmesan sauce. 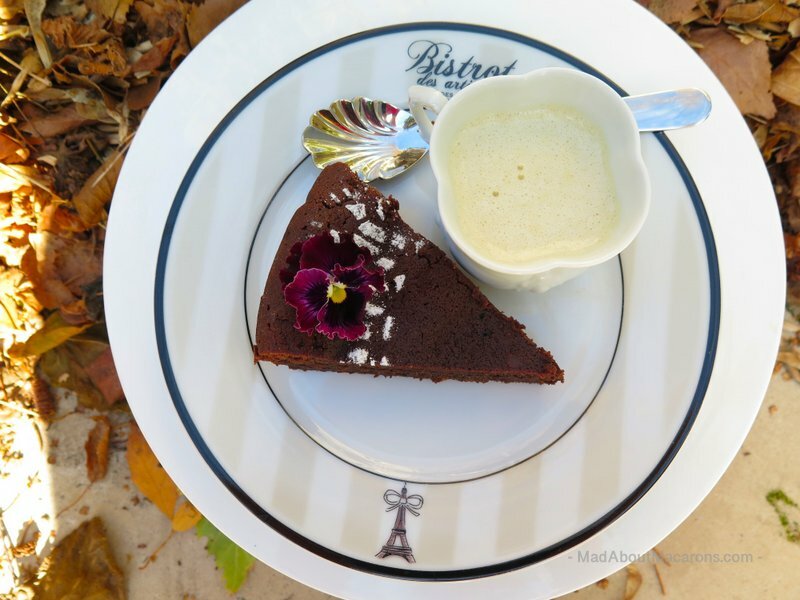 This time last year, I was generously invited to take part in Paris Perfect’s cookery classes with Chef Philippe Excoffier in Paris’s 7th arrondissement, where I wrote up this article about the delicious experience. Chef Excoffier showed us how to prepare asparagus, telling us there was nothing to beat the old-fashioned traditional way and to remove the pedoncules or spikes to make digestion easier. He also served his legendary cheese soufflés – the Soufflés Suissesse. I strongly recommend trying out his signature dish in his restaurant in rue de l’Exposition, near the Eiffel Tower. Clafoutis is not exactly the most stylish looking of dishes and not to be confused with a soufflé. While a soufflé stays upright and puffy, made with bechamel and whisking up the egg whites, the much easier clafoutis falls back down after cooling from the oven – there’s nothing to worry about when that happens: it’s totally normal and as it should be! 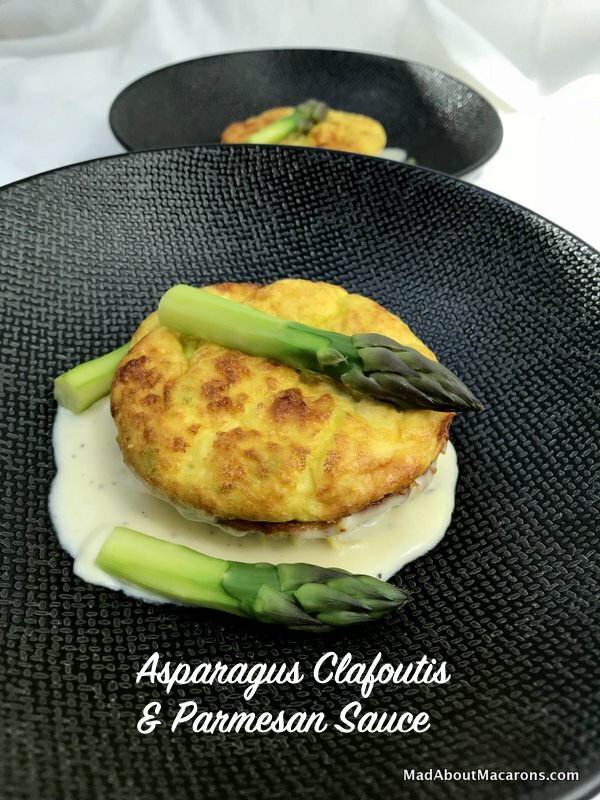 Chef Excoffier added a parmesan sauce to his soufflés and I find that this adapted version compliments the Asparagus Clafoutis so well. Although the clafoutis are already creamy inside and light, this cheesy addition means saucing it all up with the freshest French baguette. Serve them directly in their pots, to make it even easier! A perfect elegant yet simple dinner starter or light summer supper served with crusty French baguettes to mop up the most silky creamy parmesan sauce. Preheat the oven to 180°C/360°F/160°C fan/Gas 4. 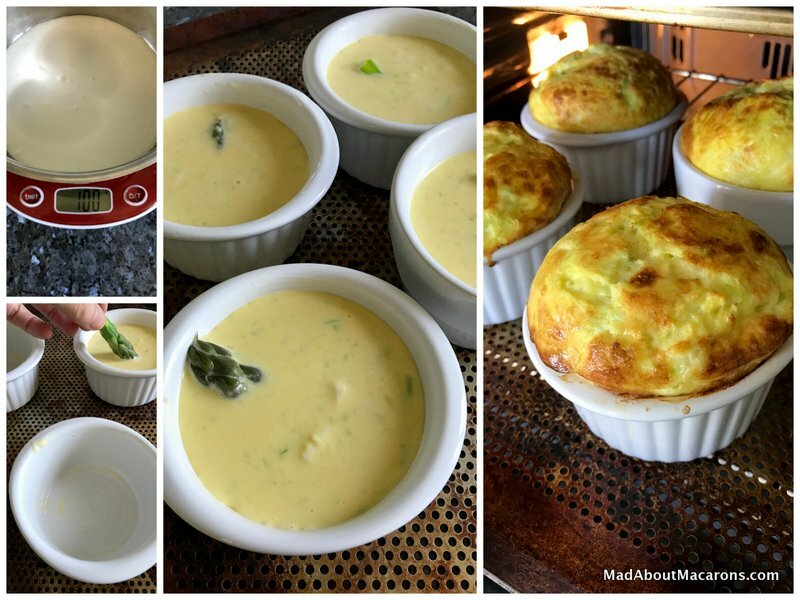 Prepare 4 ramekin oven dishes by greasing them well with softened butter. Snap the asparagus spears 2/3rds of the way down, where they break naturally. Peel them as close as possible to the spear heads then cut the spears into 3. Fill a large pan with water and bring to a rolling boil. Add a generous heaped teaspoon of salt to the cooking water. Prepare a large bowl of (preferably iced) cold water. Cook the asparagus for 3 minutes (no more than 4 minutes!) then remove with a slotted spoon and immediately transfer to the cold water to stop the cooking process. When cool, drain the asparagus, setting aside 4 spears for the decor and 4 for the ramekins. Place the others in a food processor and mix to a purée with the cream. Prepare the clafoutis batter: beat the eggs, yolks, flour, grated parmesan and season with salt and pepper. Mix in the creamy asparagus mixture then pour the batter into the individual buttered ramekin dishes, placing a third of a spear in each. Bake in the oven for about 25 minutes. Remove from the oven and leave to cool slightly for 5-10 minutes, then using a sharp knife, cut around the edges to remove and place directly on the serving plates. Bring the cream to the boil, adding some salt, pepper and a pinch of ground nutmeg. Add the parmesan then beat together well until smooth with a balloon whisk. Serve immediately around each clafoutis. Keep back one asparagus spear per person for the decor. If making the clafoutis with white asparagus, add lemon zest. There's no need for the parmesan sauce - just serve with a dash of olive oil and lemon juice. For the green asparagus clafoutis, serve with the parmesan sauce. I used 4 ramekin dishes but muffin moulds also work well, including briochette silicone moulds (this recipe makes 6 if using briochette moulds). Wine Suggestions: Serve with a rich, aromatic white wine - such as a Chardonnay, Voignier, a Pinot Blanc from Alsace, or white Rioja. 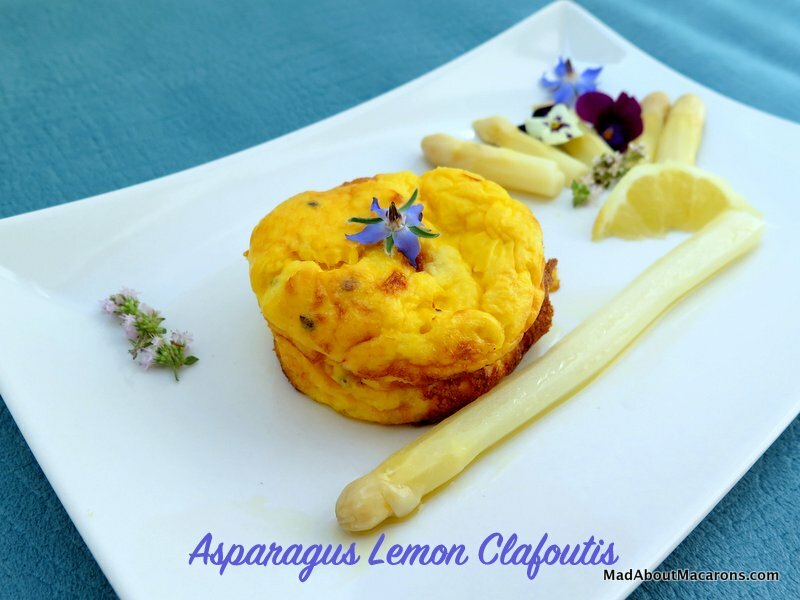 Have you made any of the recipes from le blog or fancy making this asparagus clafoutis recipe? Please do leave a comment below or take a picture and hashtag it #MadAboutMacarons. I love to see your creations on Instagram and Facebook. Thanks so much for popping in! 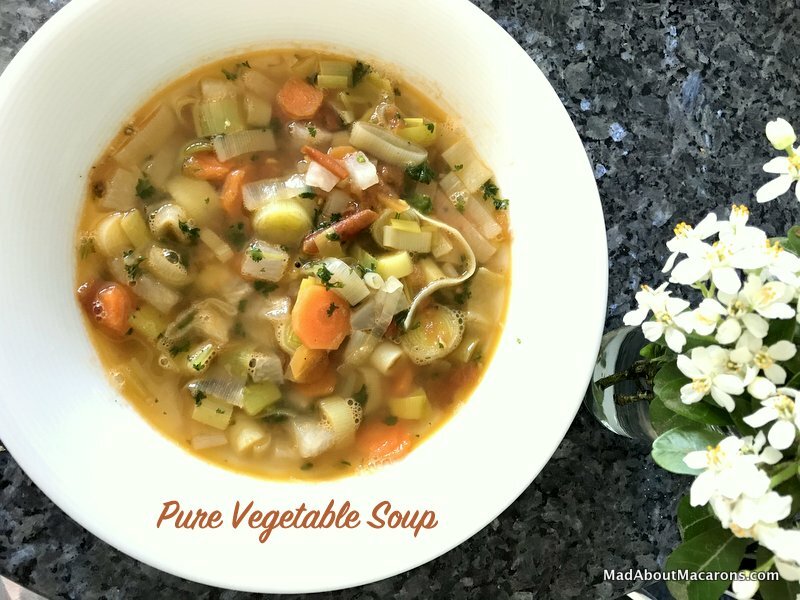 Why have I hesitated to share this Pure Vegetable Soup? It’s pure and simple fresh vegetable genius; chunky, healthy and low in calories. Moreover, this isn’t a recipe I’ve developed myself. Apart from a few different vegetables, there’s no need to change anything from Raymond Blanc’s original recipe in my favourite cookbook, “Mange“. When I first received a signed copy of it as an Engagement present in 1996, I was terrified: the French gourmet recipes for guests all looked complicated. Surely it was too difficult for me to try. However, years later, I realised with a little, insy-winsy bit of confidence, they were much easier than they looked. 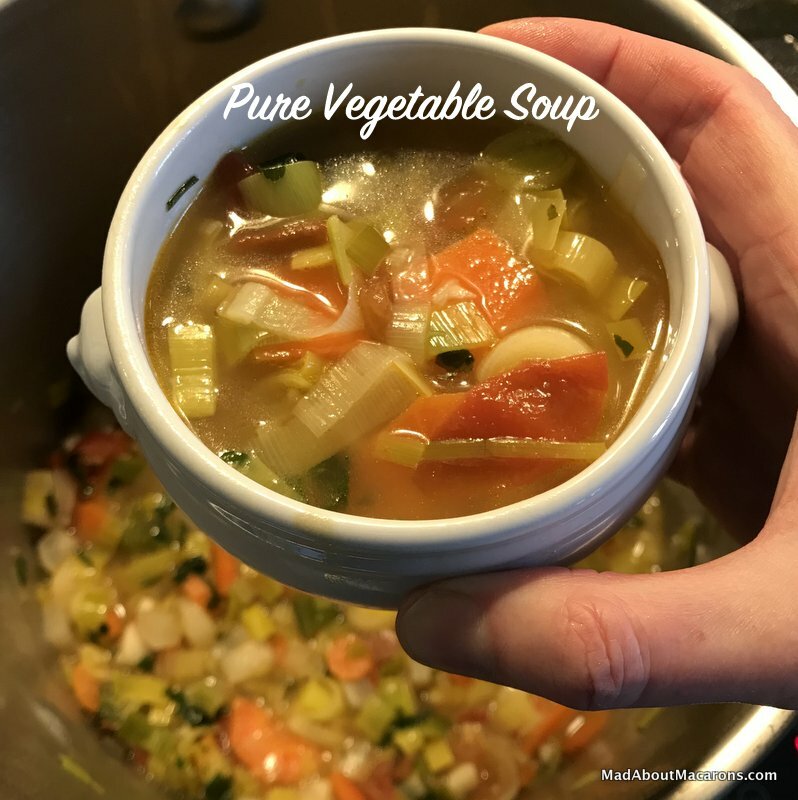 These days, I normally blend soups to a smooth velouté or chowder consistency (see pumpkin & leek, mushroom cappuccino, smoked garlic and arugula (rocket), curried cauliflower with scallops, or sweetcorn and red pepper soups, for example), so that serving this chunky almost seems daring. Is this life in the fast lane, darlings? I served this to my French (Corsican) parents-in-law last week, as they’re total soup addicts like myself. Madeleine gave it a confirmed nod of approval, but she seemed surprised: they had soup with chunks in it growing up in Corsica. You know what? Me too! I remember the chunky Scotch Broth (Janice has a good recipe at Farmersgirl Kitchen) with lamb and good old Lentil Soup (Christina has another good recipe with barley at Christina’s Cucina) with a large ham shank, when I was growing up in Scotland. Somehow, going back to the “bits in it” is somehow satisfying and, while not a thick, hearty soup, the freshness of the herbs makes this a welcome starter at only 55 calories a bowl. That’s before we add ripped off hunks of crispy French baguettes and lightly salted Normandy butter. The secret to this recipe is the freshest of vegetables and respecting the short cooking time. I know it’s tempting to use up these veggies at the bottom of the fridge that may be starting to wilt but please don’t! Honestly, if you use extra fresh, there’s no need for any vegetable or chicken stock – just the butter gives that added French touch and brings out the taste of the herbs, just thrown in at the end of cooking. Chervil is best if you can find it, otherwise flat-leafed parsley is good. In a large pan, gently melt the butter over a medium heat (don't allow it to brown). Sweat the peeled onion, carrots, and leeks gently for about 5 minutes. Add the water, the turnip, salt and pepper. Bring to the boil, skimming off any impurities (foam) then reduce the heat, cover and simmer for up to 15 minutes until the vegetables are softened. Add the tomatoes and chopped fresh herbs, cooking for another minute. 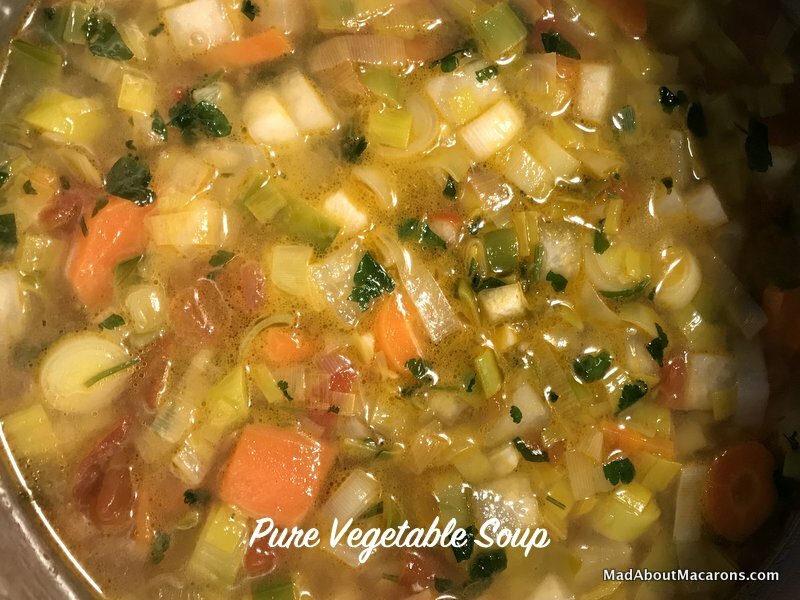 Inspired by Raymond Blanc's Fresh Vegetable Soup with Chervil recipe in his book, Mange. If you prefer your soups smooth, then liquidise with a hand blender or food processor. As I personally don't like celery, I have replaced one stalk of it with an extra leek - and adapt the vegetables according to season. You could also use vegetable or chicken stock in place of the water but I find it's not necessary when using the fresh herbs.